Choux pastry, also known as pȃte à choux, is a twice-cooked hollow French pastry. It’s made from choux paste and is typically eaten cold. A sweet version is normally filled with cream and garnished while a savory version can be filled with shellfish, vegetables, cream cheese and foie gras to be served as hors d’oeuvres. 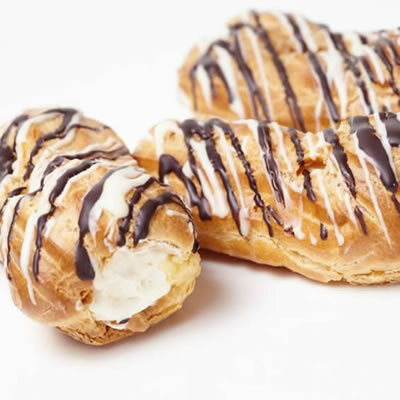 Choux pastry dough can be used to make eclairs, buns, cream puffs, profiteroles, crullers, beignets, churros, funnel cakes and many other shapes. Pantanelli, the head chef of Catherine de Medici of Florence, invented choux pastry after moving to France in 1540. That pastry named after him was, essentially, a hot dried paste with which he made gateaux and pastries which spread across France. Its irregular shape after baking earned it the name ‘choux’ (French for cabbage). Further refinement and perfection were introduced in the 19th Century by Antoine Careme. Unlike short crust, flaky or puff pastry, choux pastry dough is made from water and flour which is further enriched and lightened through the incorporation of eggs while beating the paste. Baking results in a crisp shell with a thin, moist lining of cooked paste and a hollow centre. There is no leavening agent in choux pastry. Instead, these pastries rely on the steam produced during baking to puff up and form the hollow center. Choux pastry can be shaped prior to baking to make a variety of products. Bring the milk, water, sugar, salt and butter to a boil, stir to combine. Remove from heat source, add the flour and continue stirring. Heat the mix again while stirring till the mixture becomes a cohesive mass and clears the side of the pot. Transfer the mix to a mixer with a paddle attachment. Mix on low speed until the mix reaches a temperature of around 43–60°C then add ¾ of the eggs gradually until fully incorporated. Add the remainder of the eggs until the desired consistency (viscosity) is reached. The paste should be smooth and moist but firm enough to hold its shape. Alternately, hot milk may be added to the mix to adjust its consistency. Pipe or deposit the mix to achieve the desired shapes. Bake the choux at 176°C (350°F) for 10 minutes in a convection oven with the vent closed and then at 163°C (325°F) for 15–20 minutes with the vent open. The baked product must have a well-browned exterior with a dry center. Generally, a combination of water and milk is used in the recipe but all water or all milk may also be used. Higher milk levels improve the pastry tenderness and color while high water allow for higher baking temperatures. Margarine or shortening may be substituted for butter if required. Pastry flour is preferred due to its milder protein content which prevents cracking and distortion of the pastry during baking. Bread flour may also be used, but this may require higher hydration of the flour and may reduce expansion of the baked product. A small quantity of sugar that may be added to the recipe to provide the baked product with desirable color and flavor (along with the salt). Excessive boiling of the liquids should be avoided due to possible deleterious effects on flour hydration. Overcooking the mixture after adding the flour may cause denaturation of the proteins, resulting in incomplete absorption of the eggs and the formation of a non-homogeneous mix. Since the pastry relies completely on steam for leavening, it is important to ensure there is a sufficient amount of water (from water, milk and eggs) in the paste. Both unbaked and baked choux paste can be stored in the freezer. The unbaked mix can be thawed and baked as normal when required. It is important to keep in mind that all baked choux paste products have a short shelf-life due to issues with texture deterioration. Jones, Bridget, and Robuchon Joël. “Puff Pastry.” New Concise Larousse Gastronomique: the Culinary Classic Revised and Updated, Hamlyn, 2007, pp. 293. Suas, M. “Pastry Dough” Advanced Bread and Pastry: A Professional Approach, first printing, Delmar, Cengage Learning, 2009, pp. 400-441. Gisslen, W. “Pastry Basics” Professional Baking, 7th edition, John Wiley & Sons, Inc., Hoboken, New Jersey, 2017, pp. 311-348.